“You think I cannot stop you?” he asked incredulously. Rogan itched to reach out and grab her and—throttle her. He did not need her interfering, getting in his way, being more of a hindrance than help. Rogan caught the shiver that ran through her and silently swore. Dampness was probably seeping into her bones from her wet garments. “Get out of those wet clothes,” he ordered. Her eyes popped wide. He couldn’t expect her to strip naked in front of him. Could he? “Or what?” she dared him. Two long strides had him leaning over her and planting his face so close to hers that she could see that his dark eyes were dotted with specks of gold. Another thoughtless remark that tore at her, not that she would want him to touch her, but of course he had to let her know that stripping her would be a chore. “I have no other garments,” she snapped feeling pity for Heather that she should be stuck with this rude man—if they could find her. The thought of possibly never seeing her sister again caused her legs to go so weak that she had to grab the back of the wood chair she stood beside for support. He saw that exhaustion and worry were taking their toll on her. She needed to get dry and rest. And if he was lucky, she would sleep through his departure. Then there would be nothing she could do but remain here while he saw to rescuing her sister. “Sit,” he snapped frustrated with her foolishness. His hand snapped out and grabbed her wrist, yanking her from behind the chair and slamming her against his solid chest. His dark eyes blazed with fury, and she feared she had gone too far. Release date… late spring 2014! Oh my, this is already sounding delicious. Donna: I can’t wait for this book to come out. I love when the lady has a mind of her own and a heart full of courage. The way you write is so clear, I can almost see your words playing out like a movie. I can get so lost in your books. I am anxiously waiting for this book. I know I will love it just like I’ve loved all your books. I can’t wait until this book comes out. I’m so excited. Can you please add me to your book list that way I know when it is coming out. 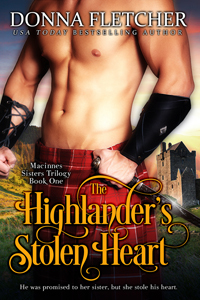 :) Thank you I also wanted to say I loved you highlander series. It was great.